From researching sustainable energy generation to developing new antibiotics naturally produced by bacteria, our dedicated faculty are changing the world with chemistry. And now it’s your turn. UNC Asheville’s Chemistry Department is structured to allow for continuous access to faculty. 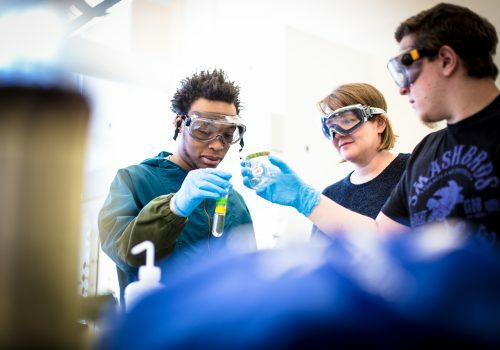 Chemistry majors receive a good deal of individual attention from faculty and have laboratory experiences not usually available in undergraduate courses. Qualifying chemistry majors can receive scholarships, research support, and mentoring through the Chemistry Scholars Program and the North Carolina GlaxoSmithKline Foundation Scholars Program. Chemistry majors can customize their course of study to their interests built upon our foundation courses in general, inorganic, organic, analytical and physical chemistry, and biochemistry. You will get to solve problems you are passionate about, from the atomic level to the earth’s environment, for example. You’ll learn how to analyze molecular structures and reactions, interpret data, and understand the interdisciplinary nature of science—preparing you for graduate programs and careers in medicine, veterinary science, teaching, government, and beyond.